How is using sea salt the same as using less salt? There are two ways to look at the issue of sea salt. First, some science for review. Ordinary salt is sodium chloride and is made of one molecule sodium and one molecule chloride. The crystals of the sodium chloride that form can be of any size. I have said in the past that the typical American eats over 6000 milligrams (or 6 GRAMS) of sodium per day. A recent article in the New England Journal of Medicine(2010;362(7):590-9) means I'm going to have to update that figure: the latest estimates, for 2005-2006, estimate that every adult male in the United States eats an average of 10.4 grams of salt per day. Here at Dr. Gourmet we try to report on research that's applicable to your daily life. That's why our Health & Nutrition Bites always end with "What this means for you:" we report on research that's strong enough, whether standing alone or taken together with other research, to warrant making some sort of change to the way you eat or live. Not long ago a reader wrote to me and asked what reducing our salt intake was going to prevent. He seemed to think that the need to reduce our sodium intake had not been adequately established and that the issue was not salt itself but rather what the salt was put on (or in). Yes, the research that links high sodium intake to high blood pressure is definitive - it's basic biochemistry. That high blood pressure then leads to things like heart attacks and strokes. Reducing the amount of sodium in our diet could save an estimated 150,000 lives per year. I've talked before about research that shows that those who gradually reduced the sodium level in their overall diet found that the same crackers tasted saltier after they'd become accustomed to a lower daily salt intake. Researchers in The Netherlands just published an interesting study in which they looked at people's responses to reduced sodium levels in bread (J Nutr 2011;141(12):2249-2255). They recruited 116 men and women from the staff and students of Wageningen University, where the researchers are based, and were assigned to one of three groups. On weekdays for four weeks, the participants ate a buffet breakfast at the university's Restaurant of the Future. Each group had the same breakfast buffet, which offered bread and an array of savory or sweet toppings or fillings for the bread, along with corn flakes, various fruits, orange juice, coffee and tea. The difference between the three groups was the bread. The control group received the same type of bread throughout the four weeks of the study. 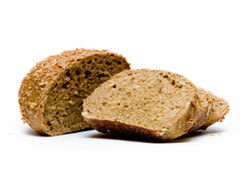 For the second group, the sodium content of the bread was reduced, week by week. Week 1 was the standard bread, then for week 2 the sodium content was reduced by 31%. For week 3 the sodium content was reduced further, to just 52%, and finally in week 4 the sodium content was reduced to 67% of the sodium in the standard bread. The third group also received bread with the same reductions in sodium, but their bread included potassium chloride as a salt substitute. The researchers monitored the breakfast choices of all of the participants and were able to measure each person's caloric intake as well as how much sodium was in their breakfast meal. They found that even though the bread was less salty, the participants did not appear to choose saltier toppings to make up for the reduction in sodium, indicating that they did not notice that the bread was less salty. At the close of the study, all of the participants were asked to taste each of the breads used in the study and rate them in terms of pleasantness, saltiness, tenderness and whether the bread had an "off-flavor." As you might expect, those in the control group (who had received regular bread all along) rated the reduced-sodium breads lower on the saltiness scale, while those who had received the reduced-sodium breads rated all of the breads higher on the saltiness scale. It would appear that their taste buds had become accustomed to the lower levels of salt in their bread. Those who received bread with the salt substitute rated saltiness for all of the breads in between the ratings from the other two groups. More proof that you can get used to less salt in your food. Here are four easy steps to reducing the amount of salt in your diet. You won't notice the difference, but your blood pressure will.